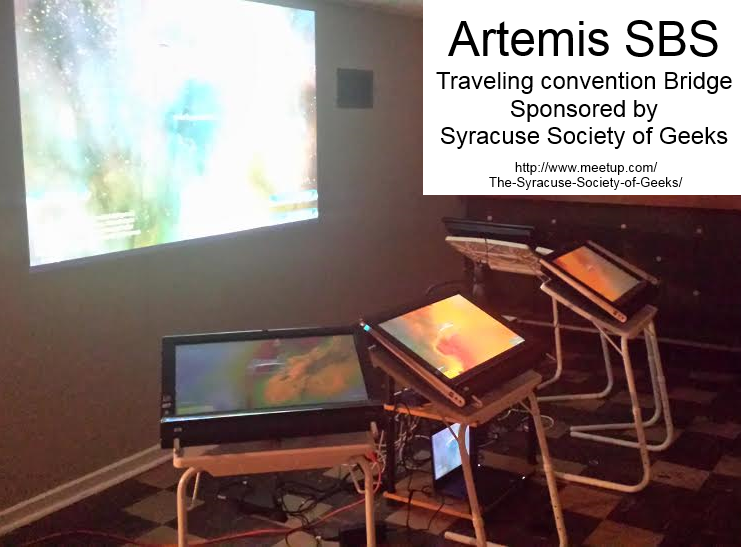 Council of Five Nations is very happy to be able to bring you the Artemis starship bridge simulator, with thanks to Eric S. and the Syracuse Society of Geeks. Artemis is inspired by the Star Trek TV shows, where up to five players take the roles of officers on the starship Artemis. Every officer but the Captain has a touch-screen computer console they use to perform their duties. The Captain gives orders to the other officers. Everything is projected up on a big view screen, just like in the Star Trek episodes. It's all controlled by a central server computer. Since our trial run last year went so well, the Artemis experience will be available at Council all weekend this year. Sessions are 45 minutes long, and start at the top of each hour (with a 15-minute break at the end of each hour). Each play session will be only $1. Tickets will be available at the Registration Desk (Even though you cannot pre-reg for this event, don't worry, we have plenty of spots available. We can take six players per hour, which is 24 per standard 4-hour event session). Sessions will begin at 2:00 PM on Friday, September 23rd, and run until about 1:00 PM Sunday. This is a great reason to get to the con early. Look for the Artemis setup in the "Green Room" area behind the GE Theater. If you are interested in helping us out, we need volunteers to run the Artemis Star Ship simulator. We will train you. You will count as a GM and thus get into the con for free. We need at least six volunteers, one for each time slot except the Sunday "G" slot. Ideally, we will have twelve Artemis GMs. We will send you a link to some online training videos, and we'll give you a quick primer onsite. Please contact us at Council /at/ swa-gaming.org if you’re interested. (Please replace the “/at/” with the usual “@” sign – our apologies for this necessary anti-spam measure). Council of Five Nations starts in less than three weeks - Friday, September 23rd through Sunday, September 25th. Mantic Games will have a rep onsite all Council weekend running quick demos of their games: Dreadball, Deadzone, Warpath, Kings of War, Mars Attacks, and Dungeon Saga. Download free rules to all these games at the Mantic website. Kings of War is the game of mass combat between mighty armies in a fantasy world torn apart by epic conflict and legendary battles. Its fast-paced, competitive rules make the game ideal for massed battles between hundreds of troops - and with Mantic's range, it's possible to do just that without breaking the bank! In vicious unground matches sinister Sponsors set up illegal, blood drenched contests between teams of players who are desperate, dangerous or mad enough to risk their lives in this no holes barred ball game. Played in makeshift arenas, bloodthirsty crowds are whipped up into hysterical frenzies as they cheer on ever more violent and exciting contests. In Deadzone, you control an elite squad of soldiers and engage your opponents in furious fire-fights within the cramped confines of an urban battle zone. Featuring stunningly detailed miniatures and fully modular scenery, Deadzone puts you in the centre of exciting battles with variable mission objectives: capture enemy intel, assassinate the enemy leader… eliminate the opposition! Please note there are no event tickets for these games. Just walk up to the table in the Vendor area and ask to play. Up to 16 brave adventures are needed to help solve the Clockwork Riddle and rescue the princess. 5th-level 5th edition D&D characters will be provided. This two-slot event features a variety of encounters demanding roleplaying, combat, and problem solving. You will marvel at and manipulate dozens of hand-crafted props. Facilitated by some of the region’s most enthusiastic DMs, this once-in-a-lifetime roleplaying event should not be missed! Beginners welcome. Be there Saturday, October 3, at 2 pm - 11 pm (slots D & E). Mike [Sanchez, the author] has lead an extraordinary effort and event this year. I was proud of last years multi-GM, multi-table event last year, but Mike has clearly and wonderfully taken it to another level. The prop value, coordination between different groups, set up, session dynamics, and individual encounters are some of the most unique and interesting that I've ever seen (in 25 years of RPGing). It's truly what roleplaying at large events should be. There are still a few tickets available for this event (D-RPG-5). If you get to the Registration Desk and they are sold out, keep checking back - tickets get traded in all the time. Council is very happy to be able to offer you events like this. It's only two days until the start of Council of Five Nations XXXVIII. We've finished processing the ~240 pre-registrations that we received. We're looking forward to another good convention this year. As we're in the final approach to Council weekend, you're probably packing up your gaming materials to bring to the con. You might be thinking to yourself you should get rid of some of those games that don't fit on the shelves any more. The Discount Game Auction is one of our most popular events, and a long-time Council tradition. We usually have a crowd of at least 50-60 bidders. It will be happening again this year during the long lunch break on Council Sunday, from 2:00-3:00 PM. We'll probably have over a hundred games and other gaming-related merchandise available. Unlike the past several years, it will be upstairs this year, close to the Registration Desk. This is an open, competitive bidding auction. If you've got some games you'd like to sell, this is your chance to do so. If you've got a few bucks left in your pocket at the end of Council weekend, this is also an opportunity for you to pick up some bargains. If you'd like to sell merchandise at our auction (any Council attendee is welcome to do so), please click here to download the Council Auction Seller's materials in PDF format (401 Kb). The Auction packet is freshly updated. It's easier then ever to prepare your goods for sale. One request... Please do not bring your items to sell until Sunday morning. We don't want to be responsible for storing them securely overnight. Please keep one other thing in mind. If your goal is to get top dollar, you'll probably want to sell on eBay or Board Game Geek. This is the Council discount game auction, after all. The general tone of the event is buying and selling bargains. Some items get bid up pretty high, but many of our items sell well below original list price. Even if you're not looking to sell, please consider the Auction a great way to spend a long Sunday lunch break as you wind down from your Council weekend. And you might pick up another gaming treasure or two to take home with you. We hope to see you at Council of Five Nations this weekend, October 2-4, 2015. We're offering something a little different this year. Alyssa Yeager, whom many of you know as the Dice Witch, will be giving a short musical performance on Friday afternoon around 1:00 PM. Our scheduled events start at 2:00, so some of you early-birds will be here around then getting the event tickets you pre-registered for. Or maybe you'll be registering on-site. Either way, please consider wandering a few paces over to the vendor area where Rhiannon's Lark will be performing. Rhiannon’s Lark was created by Alyssa Yeager (sensual vocals, growly guitar, candy-coated ukulele) to express the reality of life as a geek, goddess, and girl. Alyssa is known for her “magickal, mystical storytelling”. She brings gaming, fantasy, morality, and t-rexes together into a show that will comfort your ears, get you laughing, and possibly even <gasp> make you think. 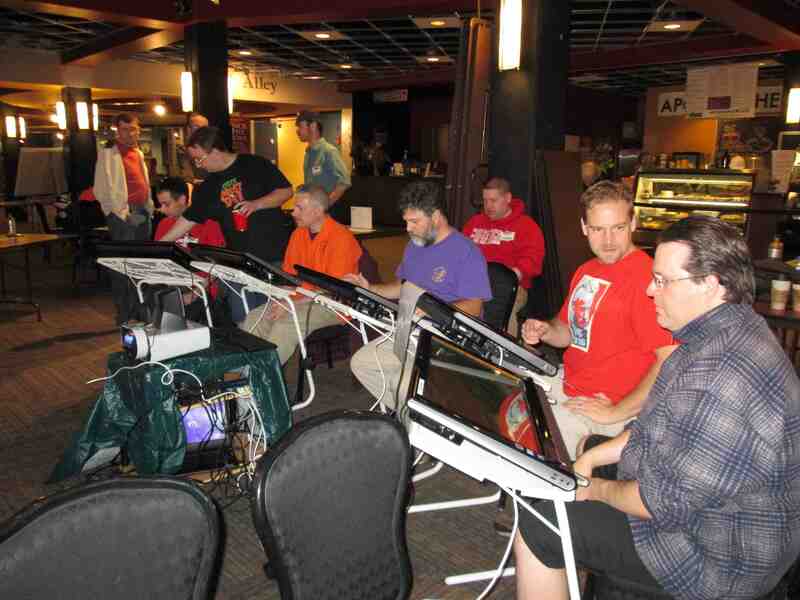 Flipside Gaming will be sponsoring free demos of several games during Council weekend. Feel free to stop by their vendor booth and give these a try. Please also remember that Flipside will be bringing a whole bunch of games as a lending library. If you're not in one of our regular events, but still looking for a game, you might want to check this out. Council of Five Nations XXXVIII is only nine days away! Over 200 events! Please also remember the deadline to pre-register and save yourself some money is Monday, September 28th. We are looking for one or more people who would be interested in helping bring a special group-interactive computer simulation game to Council this year (October 2-4). Artemis is inspired by the Star Trek TV shows, where up to five players take the roles of officers on the spaceship Atremis. Every officer but the Captain has a touch-screen computer console they use to perform their duties. The Captain gives orders to the other officers. Everything is projected up on a big viewscreen, just like in the Star Trek episodes. It is all controlled by a central server computer. We need some volunteers to "GM" this game. Don't be intimidated - you can learn in 15 minutes, and we will train you. The game practically runs itself. Organize the groups of players and start the game. Watch over new people as they get the feel for the game. Call for tech support if something breaks down. Jump in as an extra officer if a group needs another player. Yes, we really can train you in all this in 15 minutes. Volunteer to run two or more full sessions, and not only do you get into the con free, but you also get one of our special, GMs-only T-Shirts. Our apologies for the tight deadline. We need to make this happen fast so we can get the pre-reg booklet out the door soon. Days you will be attending Council of Five Nations (October 2-4 this year). * Please replace the /at/ with the typical @ sign. We apologize for this unfortunate but necessary anti-spam measure. Once again, the Council planning machinery is staring up. It's time for our annual "call for events". We get over 100 volunteer GMs every year, and we love you for it. We look forward to seeing you all again, and we look forward to those of you who are new to GMing for us. Free T-Shirt if you run two events. Please click here to see the full GM invitation. We look forward to seeing the many of you who volunteer to GM for us each year. 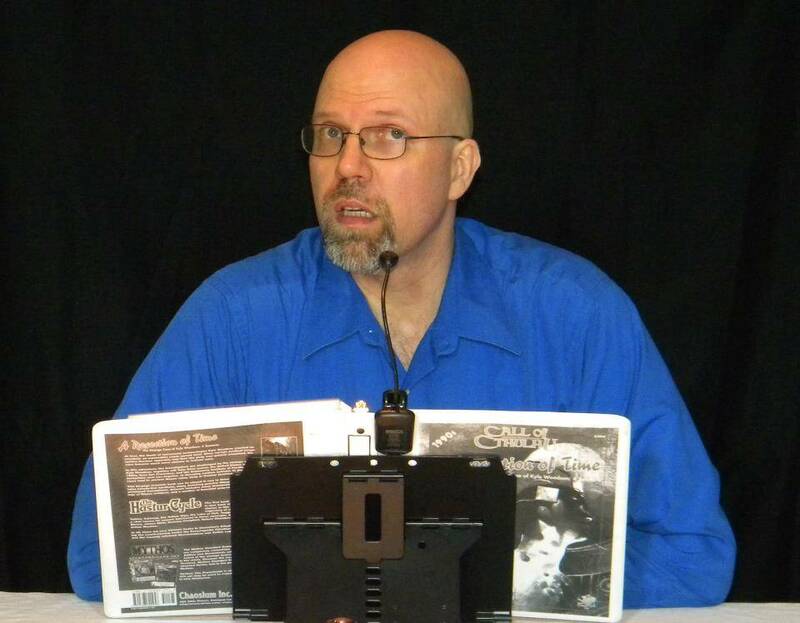 We also look forward to events from those of you who are new to GMing for us.